Finally we have hay. It was touch and go for awhile for my horses. The cows and their calves are out on pasture, so no worries there. Out of my four horses I can only turn two of them out on grass. Well, I should only turn two out on grass. The other two have to stay off grass as much as possible. They have feet problems. Founder/Laminitis. I can turn the donkey out on grass too, although she is beginning to have some problems with her feet. She has never had her feet trimmed because she tried to pin my farrier to the fence and rear up on him. She never had any trouble with her feet until this year. I am thinking with all the rain and then the heat and humidity may have something to do with her problems. 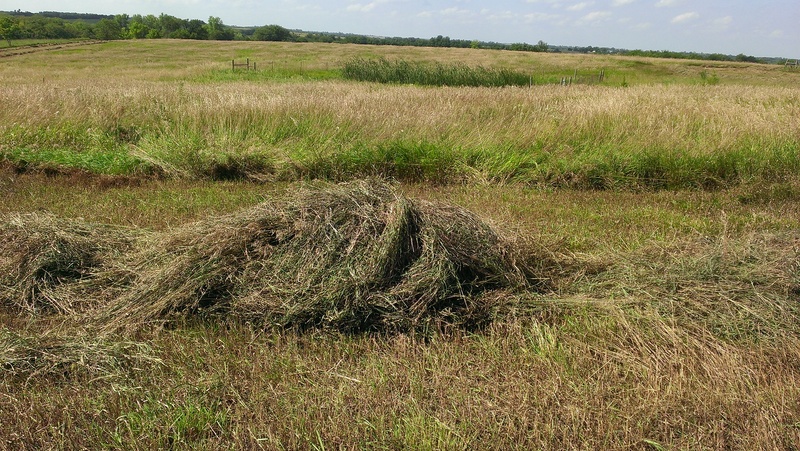 I was able to buy five bales of prairie hay for the horses from a friend who asked her supplier if he could help me out. 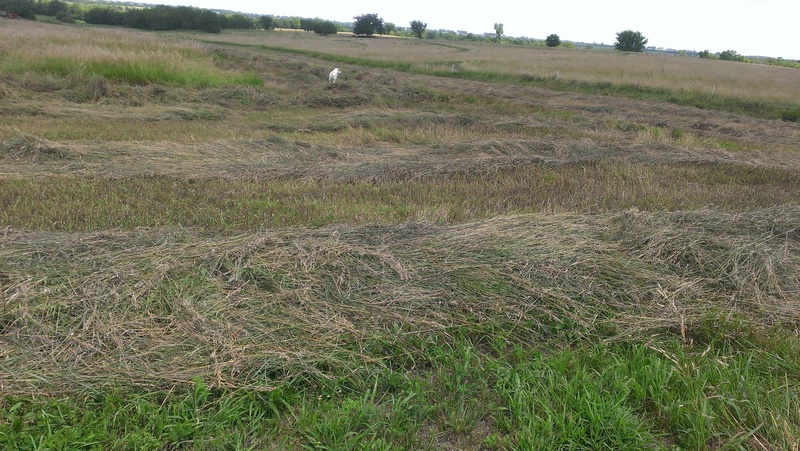 The hay is two years old, but it looks good under the outer dried layers. The horses are eating it with no problems. I may be able to get more prairie hay from her supplier in the future. 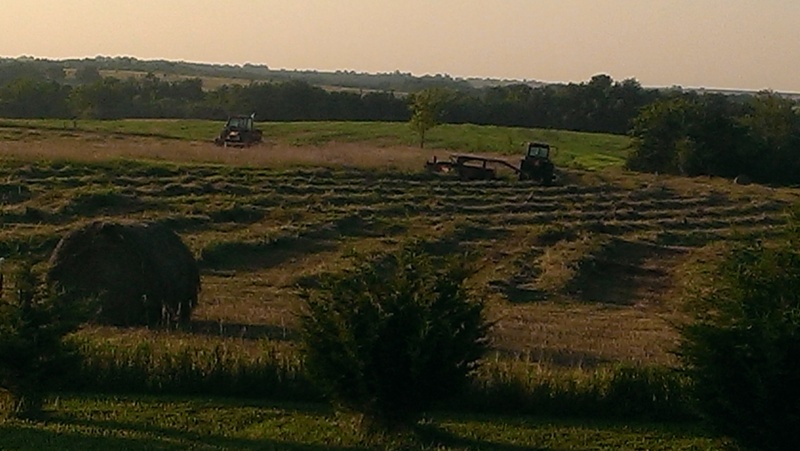 The rain and heat was part of the problem in pushing the baling of the hay late into July and early August. I am just glad we finally were able to get it cut. The neighbor family that does our hay was behind on their own hay and planting and whatever else that took priority over everything else. Many thanks to them for getting to it when they were able and getting it done. Two of the brothers wound up working together to swath, rake and bale. Thanks to all of the Phillips’ for all the hard work! If you guys hear anything stated wrong in the videos about what you are doing, please let me know so I can correct it. And thank you for allowing me to video you and putting it out in the blogging world. We didn’t get a bumper crop this year like we did in 2013, but we had a good yield. Got about 108 or 109 bales. Our bumper crop was about 140 bales. Our bales aren’t the biggest that can be baled. I don’t know how big some of the bales can be in newer balers these days. Our bales range from about 800-1000 pounds I think. Our tractor is an old Allis-Challmers D17, and it can pick up the bales pretty good. Anything much heavier and it is iffy. We had to buy a few bales in the spring from another farmer neighbor and his bales were about 1500 pounds or more (Just guessing). Poor tractor could hardly pick them up off the ground. Did more dragging into the pen, or out to the cows than anything. Well, even though we won’t be selling any this year, we hopefully have enough to get through the winter. We will be selling some cows and getting our herd down to about five or six cows. We should be pretty comfortable handling that many. Hopefully. 🙂 Have a great week! The bales do stay out in the weather, but the horses just kind of pull off the outer layers and go for the good stuff underneath. At least mine do. Sometimes I will pull off the outer layers that are dryer and not so good. The bottom of the bales get really moldy and stinky but they don’t eat that. When it gets down to that point I put in a fresh bale. My mustang will then go and roll in the old stuff. Not sure why. We do feed to the cows in the winter and into spring until the grass is ready to graze. The cows will sometimes eat the less moldy stuff. But they have four stomachs to process it. Yeah, I was pretty sure you were referring to the large bales or you would be broke. The big bales are hard to manage though, a lot of hard work to move. I’ve always been curious how your horses don’t get collic from the large bales getting mildewed. Don’t they get wet in the rain and then turn bad? How does that work? Do you just feed them to cows, or do you keep them covered for horses? Our bales are the small 110 lb variety. Are you paying $40 for that small sized, or the larger round bales? Because if so, then I’m gonna stop whining cause that’s crazy. I couldn’t own horses at that price. Here you rarely see the huge round bales that you have. We pretty much all deal in the small bales and have them delivered in squeezes. In fact I’ll be buying my next shipment in the next month. Kiss my savings account goodbye, lol. I wondered how you, and anyone in California got your hay. Especially during drought periods. We are very thankful to be able to grow our own. You are lucky to pay only $20 per bale. 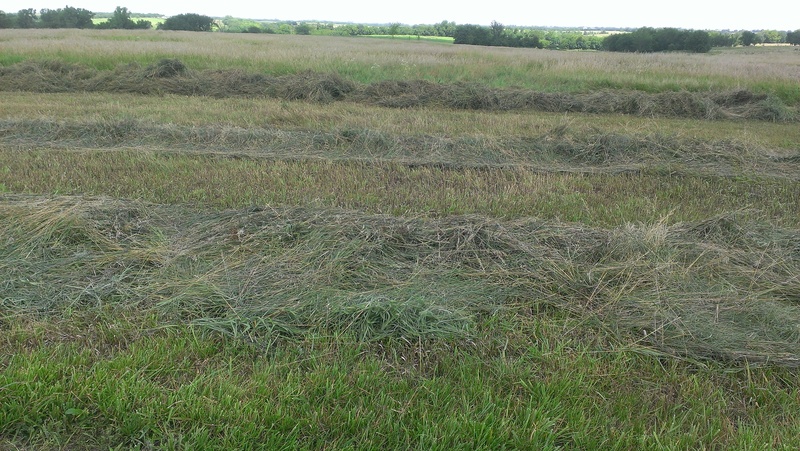 When we had a drought year in 2012 and ran out of hay, I had to pay $40 a bale. That did cover a delivery charge so it wasn’t a bad price. The bad thing about this hay was that it was not good quality hay. But hay prices around here went up to $100 a bale. And that was only for a one year drought. I hope you won’t have to pay much more than what you are paying now. Praying for much needed rain for you. Without the flooding that always seems to come after droughts. Thinking of you and others in California and other drought states.